One of the easiest ways you can give is to text “Fellowship” to 97000. You will receive a link to our secure giving site where you can submit a gift. If you wish to give stock gifts to Fellowship Dallas by electronic transfer, you will need to give your broker our account name, account number and the DTC number for our brokerage account. Please contact Accounting Director, Joan Curry, at 972.852.4106 for this information as it may change from time to time. Mobile giving is the easiest, most secure way of making your contribution to Fellowship. 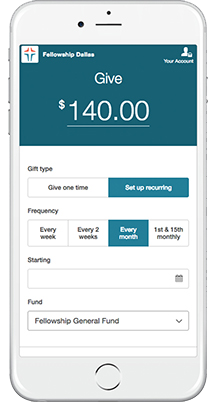 We’ve partnered with an efficient giving platform called Pushpay, which streamlines our giving and makes it easier than ever to use. Now you can give by simply clicking the button below or by downloading the Fellowship Dallas app. The first time you give, you can set up your secure account and from then on you’ll be all set!